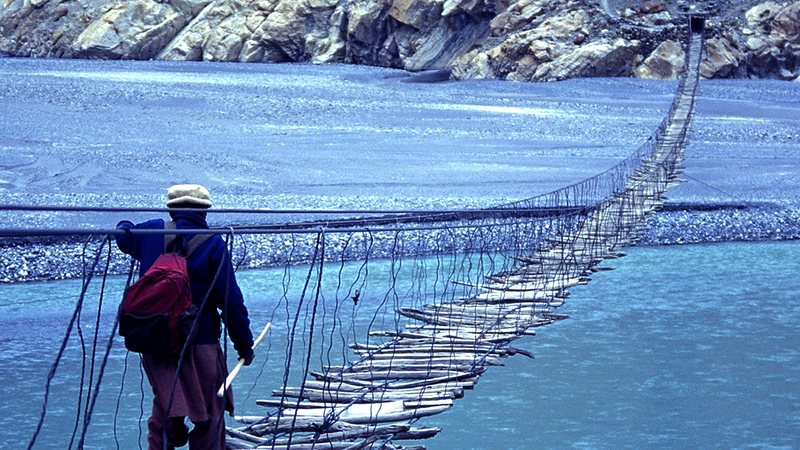 From the Monkey Bridges in Vietnam to The Trift Bridge in Switzerland we count the Top 10 Scary Bridges You’ll Have To See To Believe. It is perhaps the most unique and rare bridges ever to be constructed by man for use. Located in Vietnam, the small bridge is actually built up using logs over a small lake. The giant log placed in the center of the entire ‘bridge’ is to walk on and another smaller one is for grasping to maintain balance. This makes the users walking across the bridge look like monkeys, which is what gave the bridge its name. The Kakum Canopy Walk bridge is constructed in a thick tropical jungle in the African continent known as the Kakum National Park. It was built with the aim of increasing tourism. 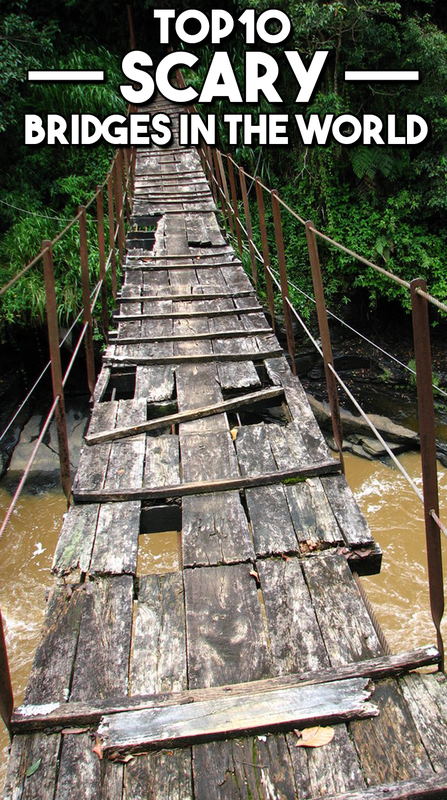 The designers of the bridge were a pair of Canadians that made sure that it was unique, adding to dangerous features of the jungle. The Canopy Walkway comprises of seven separate bridges, all hanging from the trees. It’s only 130 feet above the ground and 1000 feet of walkway. The Carrick-a-rede bridge is situated near Ballintoy in County Antrim, Northern Ireland and is one of the most famous rope bridges. The bridge connects the mainland to the tiny Island of Carrickarede. Spanning a little over 20 meters and 30 meters above the rocks below, the bridge attracts around 247,000 people annually and the experience of climbing it is usually ticketed and charged. Perhaps one of the most dangerous bridge mankind has ever seen is the Titlis Cliff Walk situated along the cliff of the Mount Titlis in the Swiss Alps. The irony is that bridge is actually for pedestrian use. It is built around three thousand meters above sea level and is the highest elevation suspension bridge in all of Europe. The bridge stretches for ninety-eight meters and is three meters wide. The amazing fact about the Titlis Cliff Walk is that it was built back in 1913 over a 5-month duration. Despite being so outdated, it can withstand strong winds and a significant amount of snow. 2 Comments on "10 Scary Bridges You’ll Have To See To Believe"
I walked the Capilano Suspension Bridge in May of 2016. Some people tried to make the bridge sway and it was quite irritating. It was difficult to walk without holding onto the sides. This made it very difficult to to do any type of photography. .The solution would be to allow only 10 at a time, but money is very important. I am still glad I walked across it. Ohh.. That sound’s really annoying.